It's Monday, Picture Books Past. There are several reasons to know about the Bank Street College of Education. 1) Its history--it was founded in 1916 to explore ideas of progressive education and it has been influential in theories and practice concerning children and their education. Check out their history here. 2) It's role in the "here and now" concept of picture book writing. Read about this movement in the mid-20th century here and here. 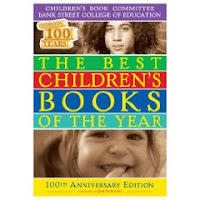 3) Its influential list of recommended books, "The Best Children's Books of the Year." See about it here and here. It's good to know these things, to round out our picture book knowledge, don't you think?